Leigh started her journey in the wellbeing industry in 2005 training as a Personal Trainer but swiftly moved into teaching group fitness. It was due to overtraining and over-teaching fitness classes that brought her to Yoga and also because of the more mindfulness benefits. Leigh trained with Sun Power Yoga in 2012 and then went on to find a practice that resonated with her – Ashtanga. Although of lot of the series is something that she finds limiting due to the physical needs of her body, Leigh still went onto train with David Swenson in 2016 and realised that the practice can be adapted for all, it’s not an elitist yoga and should never be taught as such. 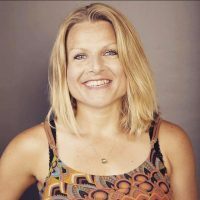 Leigh’s taught online for Yoga platforms such as Yogaia and abroad at detox retreats in Gozo and Portugal before finally settling for Cornish life with her dog Skye.